I just worked on a site where the site owner uses a marketing firm to write his blog posts. He wanted the marketing firm to be able to create new posts, but not to publish or to delete them. 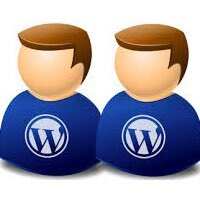 WordPress has the ability, through user roles, to assign certain capabilities to a user. In this case, the Contributor role was perfect except that contributors can’t upload images. We needed the marketers to be able to upload images with their posts. I found the perfect plugin that can change WordPress User Role Capabilities. You can write code in your functions.php file to change WordPress user role capabilities. But I was looking for something easier, and I found it in the User Role Editor plugin. The User Role Editor makes it super easy to modify existing WordPress user roles or to create new ones. It’s all point and click, no coding necessary. First, download and install the User Role Editor plugin. Go to Users > User Role Editor. The User Role Editor screen is displayed. Select the role you want to change. In my case, I selected the Contributor role. 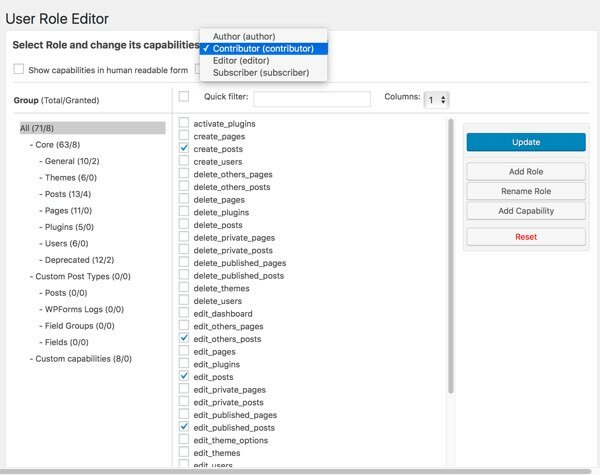 User Role Editor loads the capabilities for the selected role. Click the checkbox for any capability you want to add or remove. In my case, I wanted to add the ability to upload images, edit other’s posts, and to remove the ability to delete posts. Once you make the modifications to the WordPress user role, click Update. User Role Editor asks you to confirm the update. Test the modified or new user role. Log in as a user with the modified or new role and test it to make sure that role has the capabilities you want. If you want to create a custom role, click Add Role and then repeat this procedure.